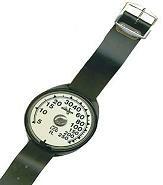 Capillary Depth Gauges are not used very much in today’s scuba diving world. They work by using a small piece of clear tubing which is sealed at one end and open at the other. Depth increments mark water levels using Boyle’s law. These are very inexpensive, but hard to read much deeper than 30 feet (10 meters). Open Bourdon Tube Gauges contain a spiral shaped tube, much like the letter “C”. Water enters one end of the tube and as the pressure increases, the tube starts to straighten out. This straightening of the tube, in turns moves another lever, which moves the depth needle. Since the tube is open at one end, clogging can be a problem. Oil-filled gauges, tried to solve the clogging problem with the Open Bourdon Tube gauges. The outside pressure, transfers the pressure through a diaphragm into an oil filled chamber. As the Bourdon tube straightens out, the needle moves to indicate the depth. Diaphragm gauges function by connecting a flexible diaphragm to a series of gears and levers that indicate the depth. If you decide to use a mechanical depth gauge, make sure it comes equipped with a secondary needle to record the maximum depth achieved during the dive. It is well worth the extra couple bucks. 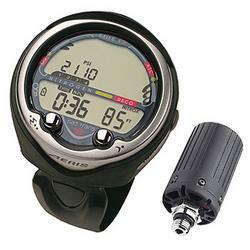 Digital gauges are battery operated gauges that “read” the depth through a transducer. Electricity varies according to the depth, in which is displayed on a digital display. Technically the transducer is a diaphragm and a coil. As the diaphragms flexes in response to the depth the pressure on the coil varies the electricity. These gauges are very accurate.